Sale, Madrid, Fernando Durán, S. A., 10 June 2016, lot 869. José María Rodríguez de Losada was a dynamic and decorated Spanish painter of the 19th century. He was awarded the Silver Medal of Carlos III as well as the highest honor at the Academy of Fine Arts of Saint Isabel of Hungry in 1854 and 1856. He was also declared an academician of the Royal Academy of Fine Art of San Fernando in Madrid, where he participated in numerous exhibitions and went on to obtain an honorable mention in 1858 and 1867. Like the master painter Diego Rodríguez de Silva y Velázquez, Rodríguez de Losada was born in Seville, where he studied painting and began his successful career under the patronage of the monarchs of Enlightenment Spain. Additionally, he was a knight of the Order of Santiago, an honor also bestowed upon Velázquez in 1659. Throughout his career Rodríguez de Losada explored a wide variety of subjects, including history painting, religious scenes, literary narratives, portraiture and costumbrismo, or depictions of everyday life. The present picture is a charming fusion of a number of these themes, as he depicts a military portrait of a Spanish Civil Guard playing the flute. The Musician is modeled by Rodríguez de Losada’s fluid brushstrokes, gracefully articulating the soldier’s dark features and the drapery of his overcoat. 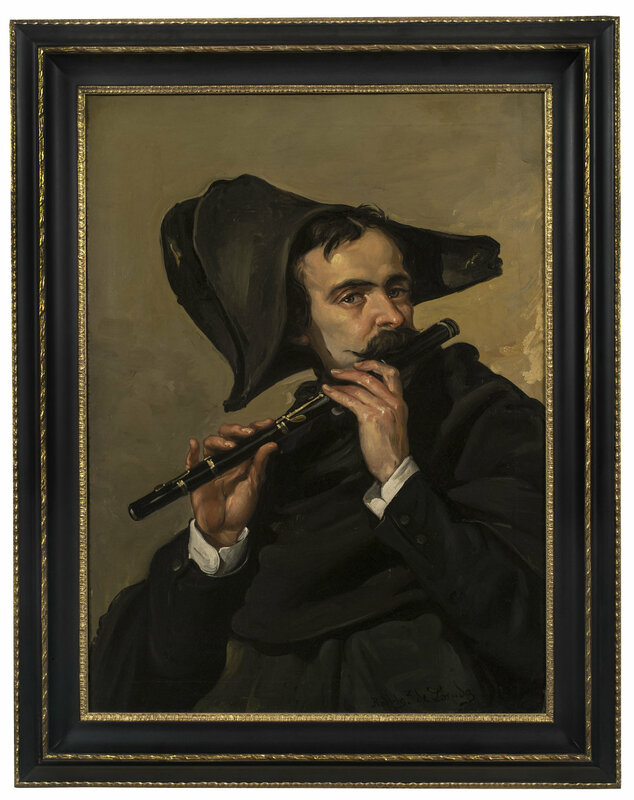 With a simple palette of black and beige tones, the artist imbues the flautist with a jaunty character, his bicorn hat cocked with its brim parallel to his flute. This beautifully painted portrait is a fine example of Rodríguez de Losada’s ability to create complex character with a restricted palette.